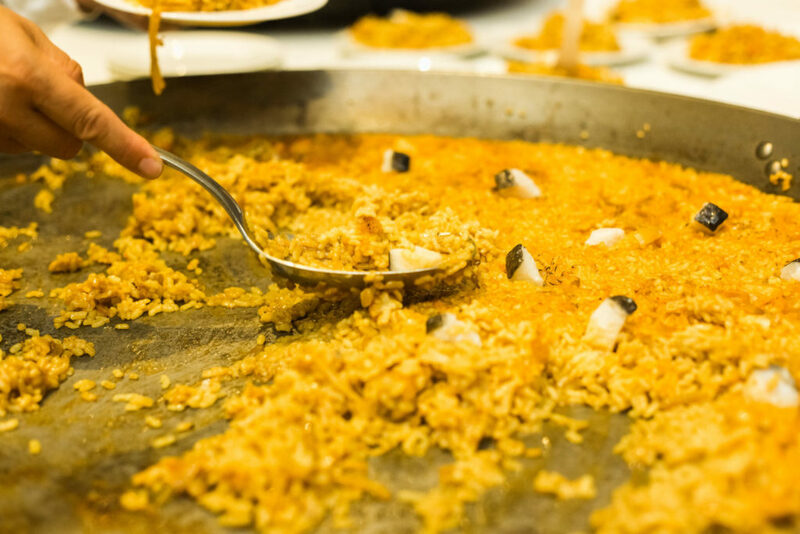 Paella, Spain’s national dish, is a Valencian recipe, so of course, you’ll want to take a paella class in Valencia and learn from the masters! This flavorful rice dish comes in many varieties. Paella can be prepared with meat, vegetables, seafood, or even black squid ink. Whatever type of paella you’re yearning to make, you’ll find the right paella class in Valencia for you. Scroll down to find a comparison of the best places to learn to cook paella. If you’d rather learn at home, you can find recipes for both vegetarian paella as well as traditional Valencian paella on our blog. Happy cooking! There are a few essentials to learn before you’re ready to make paella. The most important staple of this Spanish dish is the rice. When making paella, round rice (arroz bomba) is always used. Paellas are always cooked in special paella pans as well. In fact, paella is named after the pan it’s cooked in! Lastly, the other essential ingredient is the saffron, which gives paella its orangey-red coloring. There are tons of different ideas on how to cook paella, but these three things are vital to the dish. You’re actually supposed to let your rice burn a bit for a crispy texture! Escuela de Arroces y Paella Valenciana – This popular cooking school offers more than a simple paella class in Valencia! When you sign up for a paella class with the School of Rice and Valencian Paella, you get the full paella chef experience. If you take the morning lesson, your class will buy the ingredients together in Valencia’s beautiful Mercado Central. Later, you can choose to make Valencian, seafood or vegetable paella. If you don’t speak Spanish, an English interpreter will be present! My First Paella – Located in the hip district of Ruzafa, this paella class in Valencia will show you a different side of the city. Before you learn to cook paella, the class is taken to the local Ruzafa market for the ingredients. Recipes for Valencian, seafood, and vegetable paella can be learned in either Spanish, English, or French. You’ll also learn about the history of this happening neighborhood from the locals who live there! 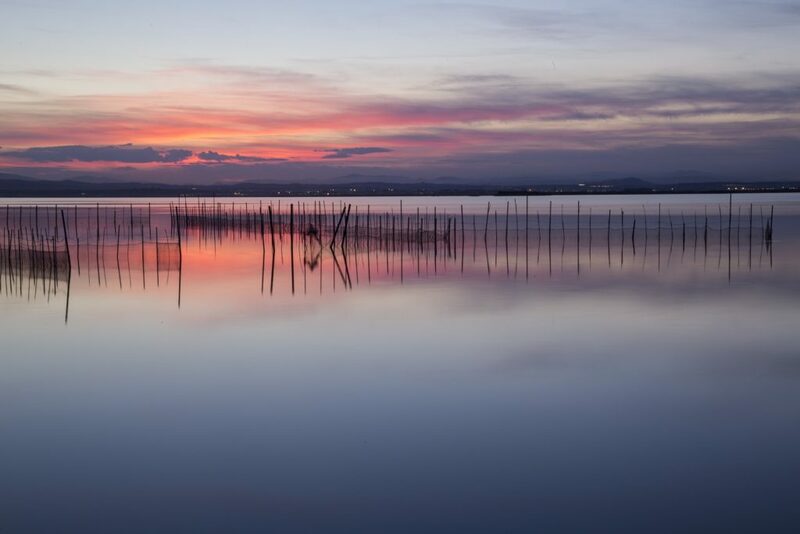 A breathtaking view of the sunset on the Albufera. The Essence of Paella – At this school, they offer a paella class in Albufera, which is a natural freshwater lake where paella rice is grown. The paella lesson happens on a real Spanish farm; this paella class couldn’t be any more authentic! Here, you can learn to make either Valencian, seafood or vegetable paella with translators on hand in English and French. You’ll even get a boat ride on the beautiful lake! Whichever paella class in Valencia you end up choosing, why not read up on Spanish wines to complement your meal? ¡Que aproveche!